With a Side of Chocolate: Boiler Up! 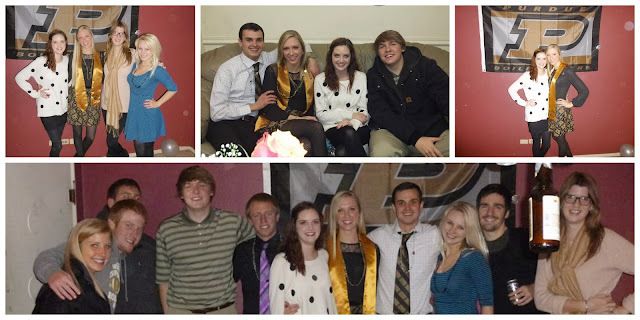 I mentioned Friday that I was headed up to Indiana to watch my best friend graduate from Purdue! It was an absolute blast and I wish I never had to leave (although I really missed my boys all weekend)! SInce so much happened, I'm diving right in this Tuesday to tell y'all all about it! I headed to the airport early because I've never flown alone so I was a little nervous. Once I tracked down my gate, I grabbed a Coke and a bridal magazine and enjoyed my little bit of time to relax. The plane took off on time and we were off to ATL. Upon my arrival, it took a little while to find where my second flight was taking off from. Once I found it, I had to trek pretty far across the airport - luckily Atlanta has a train that goes between the gates or it would've taken forever! Indy was expecting quite a lot of snow and I was hoping to get there before it started! And then our flight was delayed... and I called Katherine and it was sleeting... luckily it had stopped sleeting by the time we took off. The flight to Indy was about an hour and upon our arrival we couldn't see anything outside the window... expect snowflakes. Apparently it started blizzard-ing after we took off and there were 4-5 inches on the ground and we were the last plane allowed to land that night. It was a little scary! After hugging my best friend for a solid 5 minutes, we trekked it out to the car and started the much longer than normal ride home because no roads had been cleared yet because it was snowing so hard! I was in heaven, though, because I love love love snow and I was so happy I got to finally see some this year! We ended up going out that night (and completely forgot pictures) and staying out til 5am.... I haven't done that since freshman year of college! Needless to say, we were exhausted! Obviously, we slept in until about 1p and then laid in bed until about 4p where we got up only to greet the pizza delivery man at the door. Katherine's parents came by and brought her brother so then the three of us hung out for a bitt before heading over to her boyfriend's to watch the Purdue basketball game and go to dinner with her family. After the game, we ate dinner at the restaurant she's worked at since she moved to West Lafayette and it was so fun getting to finally see the place I hear about all the time! The food was also to die for! We had chili cheese pub chips, chicken quesadillas and mozzarella cheese cubes for appetizers and I had a fried pickle burger for dinner! For dessert, Katherine and I split an ice cream pie that had caramel and chocolate ice cream with caramel and chocolate pieces with an Oreo crust! 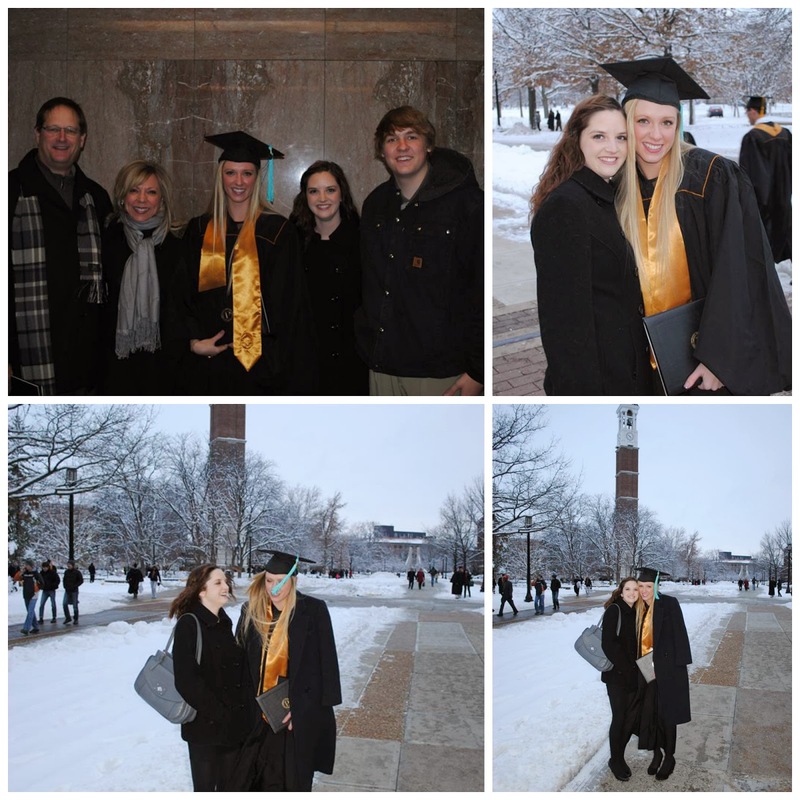 Then it was off to bed so we could get up early to take pictures before the graduations and before campus was too crazy! We were up quite early getting ready for pictures. Keep in mind it was still snowing, still windy and 10 o'clock in the morning.... It was a quite an experience! But, totally worth it because her pictures are awesome! 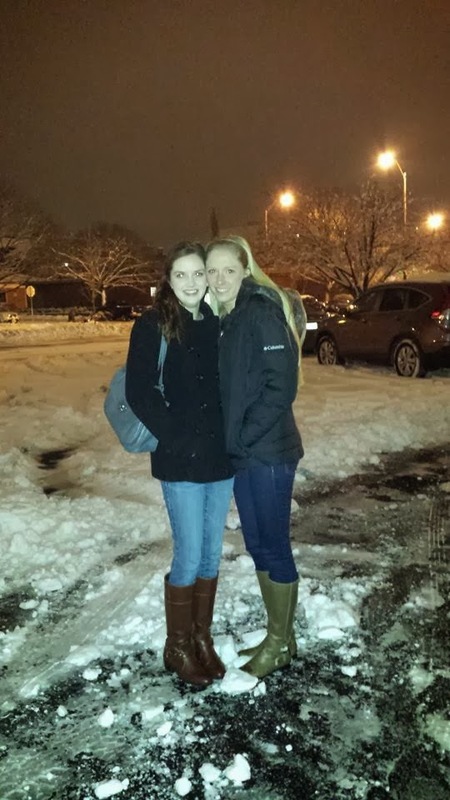 I had to include this of us warming up inside and putting our boots back on! Then it was time for a quick lunch break and off to graduation! 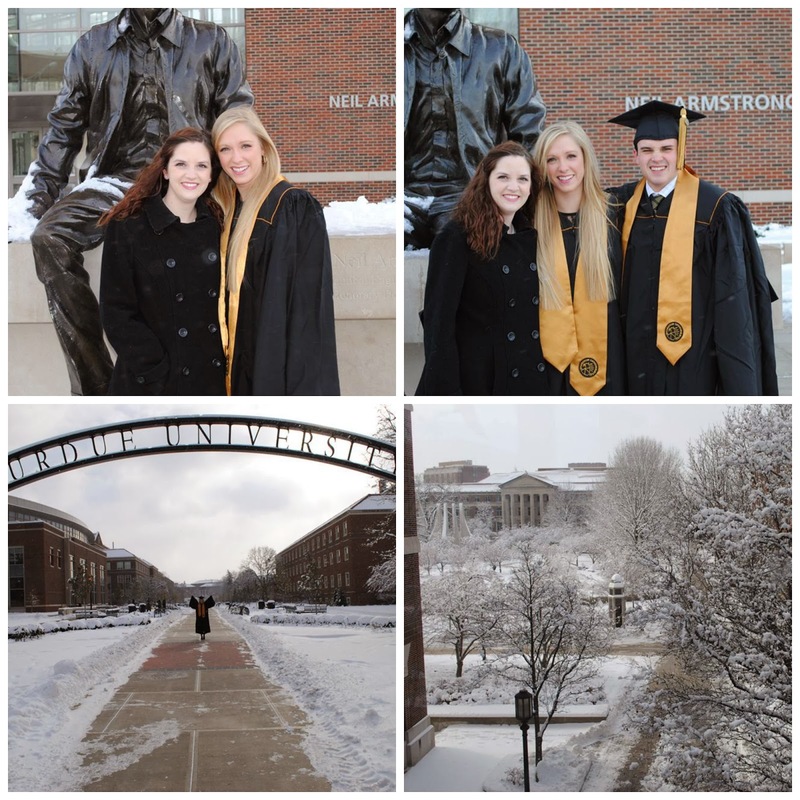 During pictures, we wore snow boots with our outfits and just put on heels for the pictures but for graduation, we had to wear our heels while walking across snowy campus.. it was COLD! We had wonderful seats right on the very top, in the very front row so we could see her perfectly! After graduation, we still took a couple pictures that you can only do after you've graduated and then it was into the heat and we didn't come back outside for a long, long time. For dinner, Katherine had gotten a chef at her restaurant to make us dinner! He spent the entire day cooking some of the best ribs I've had, Italian veggies, broccoli and cheese backed potatoes and grilled peaches and almonds. It was heavenly! We spent the entire day in the bed just hanging out and talking like we never, ever get to do. Then her family brought us lunch before they headed back to GA and we hung out with her boyfriend and brother. As the time came to get ready for the airport, I basically refused to get ready until the very last minute. Aww that sounds like a great weekend with your best friend! That's so awesome you could be there with her during such a special time!! Ugh I don't like flying alone! Can't wait to see the engagement pictures!!!! !